Have you still got your 80s hats? We wrote recently about a film currently in production for the new Museum of Liverpool. The new museum is nearing completion and is expected to open next year. More details of the the film will be released in due course but it will feature the exploits of Liverpool FC. The producers are still looking for some items from the 80s, if you can provide any of them please contact us and we’ll put you in touch with the producers. 80s LFC posters, bedlinen, or any other items that would have been in an 80s kids’ LFC bedroom. 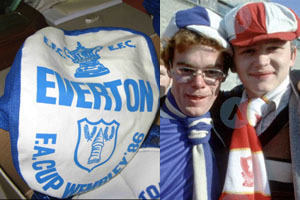 The main item they need is a hat that is the Liverpool equivalent of the blue runners-up hate in the image below, even a plain one will be of use to them as long as it’s of the style worn to cup finals of the 80s. Next Next post: Did Purslow put fans truly in the picture?